Elements Applied: The rootstock and the root bark are applied in herbal medicine. History: Since Anno Domini blackberry leaves have been applied to heal bleeding gums. Conventionally, they have also been referred to as diarrhea relief. In the early times of Greece the herb was a popular remedy for gout (it is thus called goutberry). 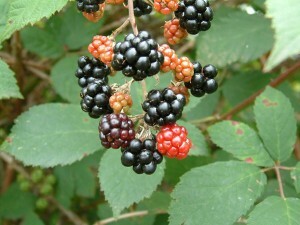 In Chinese medicine blackberry was used green for urinary tract and kidney conditions, as well as erectile dysfunction. In Rome blackberry leaves were also believed to treat bleeding gums. Blackberry decoction was successfully utilized for diarrhea. In the medieval times, blackberry leaf extract was applied topically to heal scalds and burns. Used For: Blackberry is highly valued due to its astringent properties. Consequently, the list of conditions in which it’s applied includes: hemorrhoids, sore throat, mouth ulcers, wounds, and diarrhea. Blackberry is a mild, but reliable astringent medicine, which is applied in any case where its property is applicable. It can be applied in dysentery, diarrhea, and other cases accompanied by intestine deficiency. Britons conventionally used it as a topical remedy for a wide variety of skin burns and wounds. It prevents and stops bleeding, for which reason it’s applied in leucorrhoea. Blackberry roots and leaves are famously used for treating diarrhea. According to homeopathists, long-term tea application may be helpful for leucorrhoea, recurrent appendicitis, and enteritis. Dried root extract is used in tea for relieving dropsy. According to an animal test blackberry leaf infusion decreased sugar quantity in blood of rabbits exposed to diabetes. It is believed to relieve menstrual pains, though there is no evidence towards this belief. Additional Info: Blackberry is indigenous to northeastern and central state of the USA and specially raised in almost every country. Blackberry is a climbing plant that belongs to perennials. The stem is branchy and covered with prickles, while the leaves are fuzzy and consist of 3-5 leaflets. The plant blossoms from the beginning of summer to early autumn, the flowers are white-colored and produce berries which are red colored when close to maturing and deep purple when ripe. Preparation and Intake: To prepare a decoction take one teaspoon of leaves or root extract and fill it up with a cup of water. Used in a dose of 1-2 cups per day, taken cold. In form of tincture plant root is taken when necessary in a quantity of 15-40 drops and diluted in water. Safety: According to some researches, excessive tannin intake may lead to vomiting, sickness, stomach distress and cancer. The highest tannin concentration is registered in blackberry root, then leaves and berries. People, who are exposed to digestive disorders like colitis, are not recommended to take the root. Blackberry should only be used in normal quantities under control of your health-care provider. If blackberry use results in sickness or vomiting, quit taking it and speak to your physician as soon as possible.